Caravans facilitate the transfer of goods for players wishing to turn a profit. The caravan system is an open world PvP system that revolves around opportunity and risk. Caravans facilitate the transfer of goods for players wishing to turn a profit. 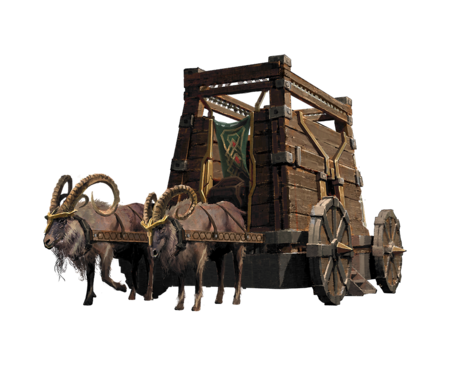 Caravans are for transfer of personal goods and quests as well as supplies for castles and nodes. Caravans may only be sent from or arrive at village nodes or above. Caravans can transport goods for more than one player. The PvP flagging system does not apply to caravans. Ramstone Hauler pre-order pack cosmetic caravan skin. There are two types of Caravans in Ashes of Creation. Quest driven caravans are used for trade routes between nodes. These caravans are system driven. These are initiated by players with a diverse choice of routes and launch windows, making them difficult to zerg. 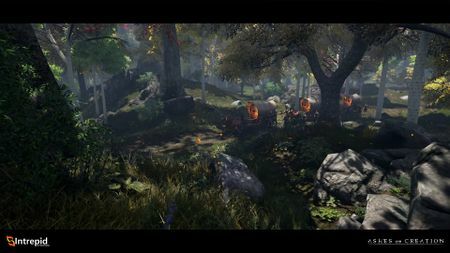 Initiating a caravan from one node to another will create a PvP objective that players will need to defend while it moves along its chosen route to the selected destination. Node-based caravan stats and capabilities scale with their node's advancement. Roads will upgrade as nodes advance. Different roads will dictate the speed and type of caravan required (off road vs on road). Self-directed (player driven/personal) caravans are able to be spawned by players in proximity to an origin location. These caravans can be launched from any point of storage. These are currently designed for a single driver. Storage points exist at Warehouses within nodes and within freeholds. Personal inventory space (weight limit) is tied to a backpack. Caravans and Mules are intended to be the primary mode of transportation of goods. Mules can carry roughly 10 times more than backpacks. Caravans can carry roughly 10 times more than mules. Caravans will have carrying capacity limits and customizable stats, such as defensive points, speed and number of hired NPC guards. Number of hired NPC guards. Caravan components obtained from crafters will have stats according to the skill of each artisan. Players initiate a caravan (via a NPC) with the following parameters. The resources it will carry. If it is initiated for a specific quest in a nearby node. If the goods are intended for trade or warehousing in a regional marketplace. The recipient of the caravan (e.g. a Temple within the nearby node). Alpha-1 Empyrean city node information panel. Mayors are leaders of a node's government who control the development of that node. 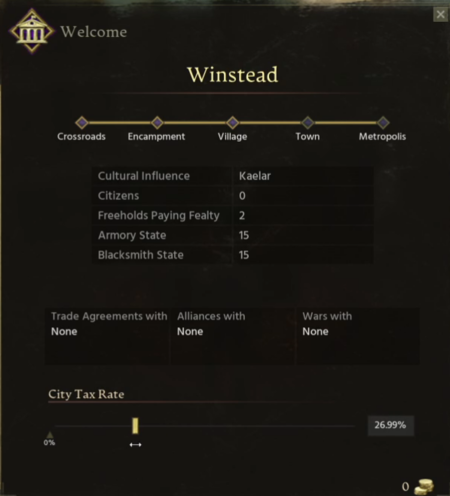 Allocate resources, taxes, and quests to help develop node defenses. Coordinate the transfer of needed supplies with citizens operating caravans. Mayors must communicate what resources are necessary for a particular node then motivate the citizens to fulfill those needs. Mayors gain new powers and responsibilities as their node advances. Caravans create an open PvP zone that flags players for combat (purple). Players will be able to state their intentions to attack, defend or ignore via a user interface. A group will be required to successfully attack a caravan. If a caravan is destroyed, it will drop a portion of the goods it is transporting. Caravans drop certificates for heavy goods that are redeemable at the origin node for a portion of the goods. Trade ships (Naval caravans) are part of Ashes of Creation naval content. Trade ships allow the transportation of trading goods. Certain ships can be hijacked. Trade ships can not be hijacked. The cargo on a trade ship will be similar to caravans in that the ship must be destroyed in order to capture the loot from its wreckage. Caravan skins ("Pimp my caravan") are available in the cash shop (cosmetic store). ↑ 1.0 1.1 1.2 About Ashes of Creation. ↑ 2.0 2.1 2.2 Livestream, 15 May 2017 (45:20). ↑ Interview, 20 January 2017 (4:19). ↑ Interview, 11 May 2018 (28:21). ↑ Ashes of Creation Store: Ramstone Hauler. ↑ 7.0 7.1 7.2 7.3 7.4 Livestream, 28 July 2017 (19:43). ↑ Livestream, 9 February 2018 (45:48). ↑ Interview, 6 December 2018 (20:30). ↑ Livestream, 18 July 2017 (44:57). ↑ 15.0 15.1 15.2 15.3 15.4 Livestream, 22 May 2017 (40:41). ↑ 16.0 16.1 16.2 16.3 16.4 16.5 16.6 Livestream, 28 July 2017 (20:56). ↑ 17.0 17.1 17.2 17.3 17.4 17.5 17.6 17.7 17.8 Livestream, 30 June 2017 (53:57). ↑ Livestream, 12 December 2018 (14:48). ↑ Livestream, 17 November 2017 (9:49). ↑ Livestream, 22 May 2017 (40:40). ↑ Livestream, 15 December 2017 (1:04:25). ↑ 27.0 27.1 Livestream, 5 May 2017 (8:22). ↑ Livestream, 5 May 2017 (6:12). ↑ Livestream, 23 August 2017 (28:22). ↑ 34.0 34.1 Livestream, 8 April 2018 (AM) (15:46). ↑ Livestream, 8 April 2018 (PM) (1:20:03). ↑ 41.0 41.1 Livestream, 22 May 2017 (57:37). ↑ 42.0 42.1 Interview, 11 May 2018 (44:20). ↑ 43.0 43.1 Interview, 8 August 2018 (11:52). Deze pagina is voor het laatst bewerkt op 18 mrt 2019 om 22:05.